Should the Lonesome Road message be that of the trailer dialogue (as it is now) or the just coordinates with Ulysses signature (like the load message indicates) ? What would the coordinates be? I might upload a readme to the Doc page, I don't include them in the game file anymore since I have a habit of editing descriptions post release. is this compatible with mmue? In case you haven't been told yet, that mod is broken all to hell. To elaborate, you should be using YUP instead of MMUE. Is there a way to make it so that DLC quests will not start automatically by you just finding their start location but ONLY if you listen to broadcasts? I always explore Canyon Wreckedge and Mojave Drive-in early, wich triggers OWB and LR quest to start and I don't want that. Yes, but you'll have to modify the script. Would you be willing to elaborate on how to do that maybe? I don't know much about scripting. I don't know if this is a right thing to do, but it seems to be working on some level at least -- I now get quests for DM and HO only if I listen to the radio and LR doesn't start automatically at Wreckedge. But again, I dont know if this is a proper edit and I don't know what to do with OWB. If I get it right, OWB script should be something similar to the scripts for other DLCs. Something like this maybe? I replaced OWB script with this one wich stops broadcast and quest from appearing near Drive-in, although that sound of a broken radio still plays. But as far I understand there is now no actual radio station for OWB placed in the word like for others in SimpleDLCDelayScript, so I can't recieve quest from it. And my attempts to create one so far have been unsuccessful. I haven't tested it, but this script should work. You'll need to listen to the broadcast for 25 seconds to receive the quest. Thank you, seems to be working fine. That's a pretty interesting option and I'd like to see it integrated as an optional file. I should also add that the mod is at the very bottom of my load order. Check FNVEdit and see if there are any mods that affect FormID 03002FD1 and 03002FD3. Post your mod list to Pastebin and link it. You don't need Improved Transportalponder, it's already integrated in to UP+. All right nevermind, using LOOT to sort my load order rather than Vortex's integrated load order sorted fixed the issue. Thanks for giving it a look though! I appreciate the work you did on this mod, also if by any chance you notice any redundancies in my mod list, I'd love to hear it out. Don't use Vortex for NV, and don't use Vortex for serious modding in general. At least, for now and in close future. Vortex developers efforts deserving a respect, but it's not a reliable mod manager for now. Use MO or NMM. Can you make this for TTW? Delay DLC - TTW needs to be updated. I don't have Fo3, others are free to modify and upload their own version of this mod though. Tiny but essential mod. Thank you! So this is my first time playing through the game with the DLC. Do I need to do something other than listen to the radio broadcast in order to start DM? I'm in Forlorn Hope and listened to the full broadcast two times and didn't get a quest. Do I need to be a certain level? What version of NVSE and JIP LN are you using? what's your load order? Both my NVSE and JIP LN are current (5.1 and 54.20 respectively). It looks like the last one (for LR) is also being modified by YUP, but your mod is winning the conflict (I think). DLC Delay is the only mod changing the other three. Well, never mind. It apparently works now. Didn’t do anything differently. Maybe the game/my computer just needed a restart. Thanks for the responses! "Enjoy not being bombarded with quests and messages at the start of the game." It's over very shortly so why is this a legit complaint? 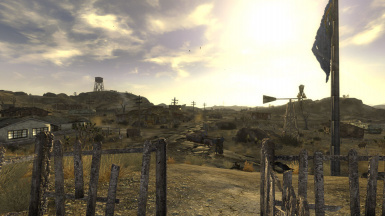 You step out of Mitchell's house and want to take in the scene, this is the first time you see the Mojave Wasteland after all, but instead you get a bunch of immersion breaking crap stuffed in your face. Also, you'll have four quests in your log that you won't be doing until much later. I still find it not an issue. That's fine, this mod is for people that do. I find it a big issue myself because once the game starts I'm supposed to be role playing my character and therefore I don't want to deal with system notifications such as what DLCs I have purchased. Lol. If you don't find it an issue, why are you here? Plenty of us do for a variety of reasons. Does DM have any other requirements before getting the signal? I walked around the abandoned brotherhood bunker and the radio never picked up the broadcast. It doesn't, do you have the latest NVSE + JIP LN? What's your load order? The DM and HH radios do not start automatically, unlike the OWB one, they will just appear in the radio list. You can cheat your way to any location, so long as you exit Mitchell's house the normal way. It's how I test the mod usually. You wrote that the DM broadcast did not start, but did it appear in the radio list of the Pip boy? do the OWB and/or HH radios work for you? No. The OWB broadcast worked at first, but when i tested it again it did not. I haven't tried the HH signal. EDIT: I got it to work. turns out I didn't have the newest NVSE, I could have sworn I did. It's working fine, atleast with DM and OWB, I havent tested it with HH but it seems fine now. That's strange, the mod should've warned you if your NVSE wasn't up to date, I will have to take a look at this. Glad you got it to work!